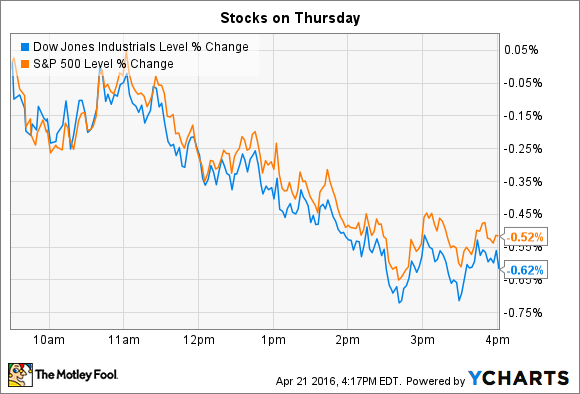 Why these two stocks made big moves on Thursday. Individual stocks on the move included Under Armour (NYSE:UAA) and Mattel (NASDAQ:MAT), which both posted quarterly results before the opening bell. Under Armour spiked 7% higher after beating consensus estimates on both the top and bottom lines. The apparel-and-footwear giant booked a 30% bounce in Q1 sales as earnings rose to $0.04 per share from $0.03 per share a year ago, rather than dropping as Wall Street expected. That marked Under Armour's 24th consecutive quarter of at least 20% revenue growth. The footwear business was the standout performer, thanks to blockbuster demand for the Stephen Curry basketball line. That division grew by 64%, and now accounts for 26% of the business -- up from 20% last year. Under Armour's international expansion also seems to be gaining steam as revenue from outside the U.S. jumped 55%. "The strong results posted this quarter truly demonstrate the balanced growth of our brand across product categories, channels and geographies," CEO Kevin Plank said in a press release. Gross margin slipped to 46% of sales from 47%, and while that's likely not a reflection of pricing pressures, investors will still want to keep an eye on this metric as we move through fiscal 2016. It should be a notably strong growth year, too: Under Armour executives raised their sales and profit outlook on Thursday to reflect the latest operating momentum. Mattel's 6% drop on Thursday made it one of the S&P 500's worst performers after Q1 earnings failed to impress investors. Sales declined 6%, and the toys-and-games maker posted a wider-than-expected operating loss. The shrinking numbers contrasted sharply with rival Hasbro (NASDAQ:HAS), which last week touched a new all-time high on the back of double-digit sales growth, and a near doubling of profits. Barbie's growth pace declined this quarter. Image source: Mattel. The common thread in these two results is Disney (NYSE:DIS), which moved its Princess and Frozen-branded toy lineup over to Hasbro from Mattel beginning this quarter. It isn't hard to trace the impact of that switch, either: Hasbro's girls segment jumped by 41%, while Mattel's girls business (not including Barbie) plunged 62%. Given the loss of the Disney Princess franchise, things could have been worse. In fact, despite flat sales for the core Barbie brand, Mattel executives believe the company is in a solid position, and that growth should pick up in the second half of the year. "Our performance is in line with our expectations, and we remain on track to deliver on our outlook for the year," CEO Chris Sinclair said in a press release. It's encouraging that Mattel's expenses are dropping, and that the Fisher-Price franchise is selling well. However, declines in several of its other key brands -- and flat sales for Barbie -- won't be enough to completely offset its lost Disney licensing partnership.